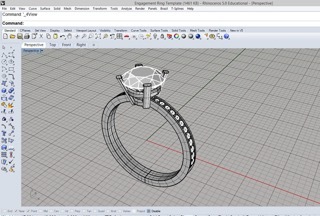 This class is designed to build a solid foundation with Rhino 5 as it is used in the jewelry industry. However, professionals in other fields can benefit from the class. Participants will learn step-by-step 2D drawings and 3D modeling with various exercises and strategies. Jewelry design theory and application, construction methods and techniques are also covered in the class. Supported digital materials such as tutorial Rhino files, various stone templates and cutters, etc. are provided for your use. Projects include earrings, rings, cuff links, and diamond settings, etc. This online class uses GoToMeeting software. The class will be conducted live and each session will be recorded so you can replay, review and practice after the class. Rhino 5 for Windows—if you do not own Rhino, you may download the free evaluation version here. A good internet connection is important, however, videos are posted after the session for you to review. No prerequisites but knowledge of jewelry design and manufacturing is helpful. About the instructor... Akiyo Matsuoka is an Authorized Rhino Trainer, Rhino Instructor, and adjunct faculty at Fashion Institute of Technology in New York City.